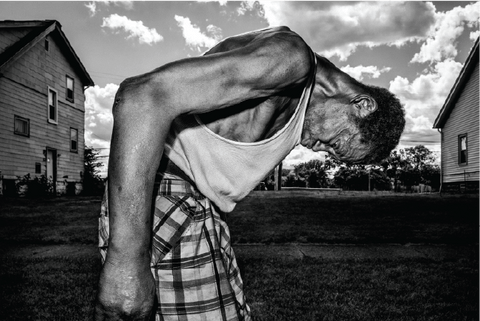 Detroit: Against the Wind is Magnum photographer Bruce Gilden’s ode to the Midwestern city and its inhabitants. The exhibition, commissioned by Leica UK, will include more than 20 new photographs taken by Gilden earlier this year, shot on the Leica S-System and M-System. 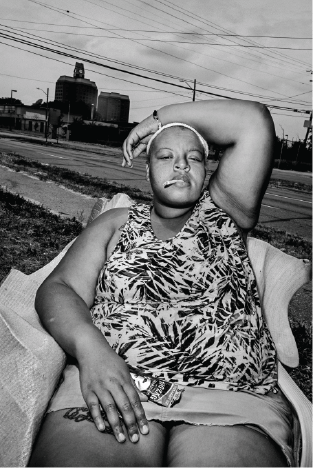 Following on from his series taken in 2009 in Detroit, documenting foreclosed homes and their owners, Gilden returned to the city once more, inspired by the beauty of its neighbourhoods in disarray and the vibrancy of its people, to capture the spirit of this special American city. In the 1950s, Detroit’s population peaked at 1.8 million and today that number is fewer than 700,000. The city, which is the size of Boston, San Francisco, and Manhattan combined, which could conceivably hold another million people, is instead filled with empty houses and stores. In 2013, the city filed for bankruptcy, $18.5 billion in debt. ”In spite of the recent widespread ‘urban revitalisation’ process underway that seems to only affect the central downtown area, Detroit is still in disarray, a partial ghost town with the worst school system in the United States." “It’s hard to believe that forty years ago this was a major American city, a shining example of the American Middle Class, and a prosperous epicenter of industry and creativity; namely, automobile manufacturing and Motown, the legendary record company." 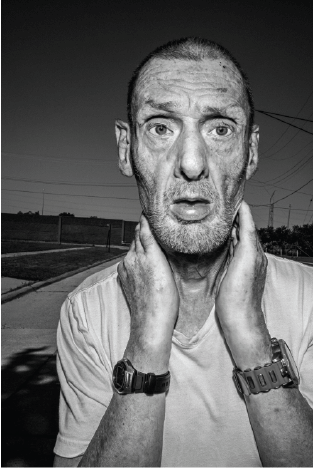 Born in 1946, Bruce Gilden studied Sociology at Penn State University, before being drawn to photography. After seeing Michelangelo Antonioni's classic 1966 film, Blow Up, he decided that he, too, would become a photographer. In 1968, he bought himself a cheap Miranda camera and supported his burgeoning photography habit by driving New York yellow cab, but found that the job left him no time to take pictures. He quit this job and began driving a truck part-time for his father’s scrap metal business, walking the streets with his camera on his days off. Throughout his career, Gilden has been drawn to strong characters. Gilden has applied, with increasing intensity, Robert Capa’s mantra to his own work: 'if the picture isn't good enough, you aren't close enough'. Gilden's powerful New York work, begun in 1981, has brought him worldwide fame: his confrontational, graphic style and his use of flash have rendered his black and white images immediately recognisable. His career has taken him across his native US (with long-term projects in New Orleans and Coney Island), then to Haiti, Portugal, Romania, Russia, Australia, Japan, and the UK, among numerous other destinations. 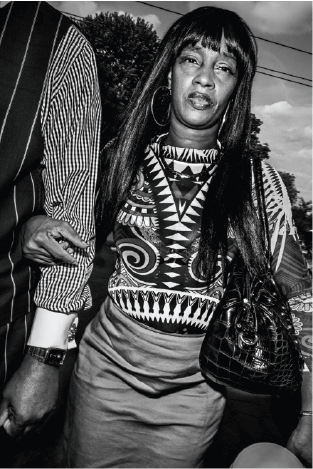 Bruce Gilden’s work has been exhibited widely around the world and is part of many permanent collections such as MOMA, New York, Victoria & Albert Museum, London and the Tokyo Metropolitan Museum of Photography. Bruce Gilden joined Magnum Photos in 1998. Already the recipient of numerous grants and awards (among them three National Endowment for the Arts and a Japan Foundation Fellowship) in 2013, Gilden received a Guggenheim Fellowship. 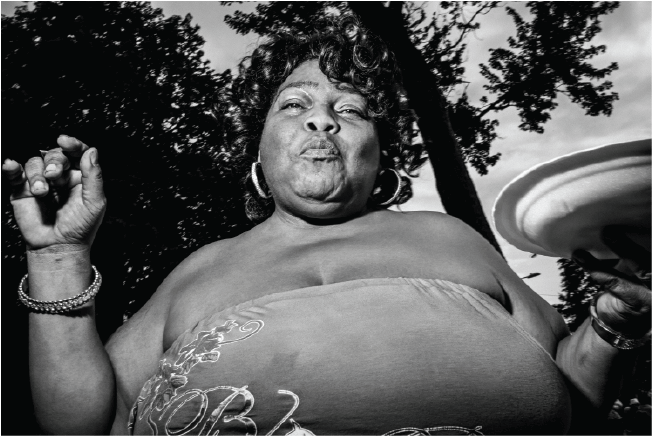 To coincide with the opening of the exhibition, Bruce Gilden will be running a special Masterclass entitled BE YOURSELF from 17-30 September, at the Leica Akademie UK. In this four-day intensive workshop, Gilden will set personal assignments that will provide the opportunity for participants to photograph throughout the workshop whilst receiving daily, constructive feedback to define and understand their personal vision. Open to both amateurs and professionals, photographers will learn how to improve their images and how to be ‘street smart’ in various shooting environments - honing in on that ability of being 'in the thick of it' while remaining unobtrusive.